Min Cookson has worked in the real estate industry since 1998 within the Selwyn and neighbouring districts. A constant achiever and hard worker, Min has built up a high-quality client base from both her work and community activities. Through her efforts, she has gained respect from past clients and enjoys ongoing working relationships with these clients, assisting them with repeat and referral business. 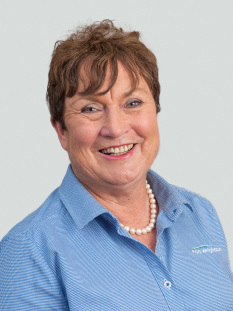 Min has extensive knowledge and expertise within the Selwyn rural marketplace and specialises in the marketing and sale of farms, lifestyle, bareland and rural-residential real estate. She began her career in 1998 after successfully farming at her home farm of “Pinewoods”, Hororata. Her son, Tim and his wife, Lucy continue this legacy as fourth generation farmers while Min resides on a lifestyle property near West Melton, keeping up with the rural lifestyle she enjoys. A passionate advocate of the local community, Min is now sponsoring the “Active School Programme” at Hororata Primary School, where she has three grandsons in attendance and where Min herself completed her primary schooling many moons ago! The “Active School Programme” allows pupils the opportunity to give all sports a go. Min is also active in the Hororata Community Trust and its efforts to rebuild following the September 2010 earthquake. Min’s name consistently appears in the list of “Top 10” rural salespeople for PGG Wrightson Real Estate, and her success is backed up by the total commitment and support of PGG Wrightson’s full service rural company.